I’ve moved Dr. Seuss’ The Lorax out of the Annie nominees because it bombed with the critics and replaced it with Madagascar 3: Europe’s Most Wanted. 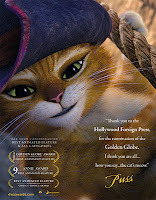 I’ve also decided to predict a four movie nominee list at the Oscars, so have cut The Pirates! A Band of Misfits. Seriously, this is the greatest, furriest list of movies to be nominated for the Ursa Majors ever. What a year. I am officially labeling 2011 the anno mirabilis of furry movies. There has never been a year like it before; the five movies that made the cut managed to win out over a crowded field of other furry possibilities that would have been a lock for the category in just about any previous year, including The Muppets, Rise of the Planet of the Apes, and Winnie the Pooh. But enough about them; let’s take a look at our nominees’ chances. The wild card in the deck, this is the first furry created movie to be nominated for the award, and it makes it hard to predict how it will do. Its unique status gives it either an unfair advantage, or an unfair disadvantage, and I’m still not sure which. The unfair advantage is obvious. There is a big chance that a large contingent of voters will vote for it, sight unseen, just because it was made by another furry. On its own terms, it is actually a decent example of what it is; a fan film. In terms of the competition, it really can’t compete with four Oscar nominated studio films. Its real strength to pull out the win, however, is that with four strong competitors, I can see them cancelling each other out with Bitter Lake pulling in a lot of “compromise” second and third place votes. 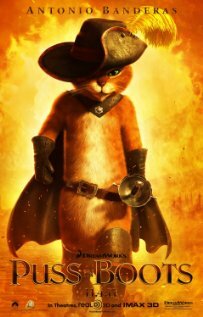 My review: I did not review this movie, but here is the Flayrah review from SkippyFox, and fellow Flayrah reviewer dronon’s review on Anthro. My odds on pick to win the Ursa Major. Month by month, it has been my top pick, with only two months led by other contenders (Bitter Lake in August and Rango in January). I only have five concerns. Four of them are Bitter Lake, Puss in Boots, Rango and Rio, and I’ll explicate those concerns further in their sections. The fifth concern is Bolt which the first Kung Fu Panda lost to (rather inexplicably, in my opinion) back in 2008. The lesson there seems to be some furries just don’t like the concept. Since then, however, the cult of Kung Fu Panda has only grown, and the second movie only contributed to this growth. 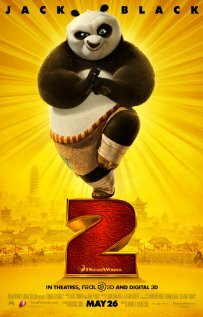 I keep saying basically the same thing, but if Kung Fu Panda 2 doesn’t win this year, Kung Fu Panda 3 will probably win when it comes out. I originally wrote this movie off, though I honestly should have seen it as a contender for the Ursa Major from the beginning. After all, the titular character first appeared in a previous Ursa Major winning movie, and his introduction is arguably one of the reasons Shrek 2 won that year (a vastly weaker field being another). The movie’s biggest strength, however, is probably actually a matter of fortuitous timing. It came out on DVD and Blu-Ray late last month, so it is currently the newest movie on the list. This is an advantage that cannot be underestimated; most Oscar contenders come to theaters in December for a reason. Plus, it seems to be the only movie that at least acknowledged the furry fandom (besides Bitter Lake obviously), with an ad campaign that appeared to be winking in our direction. Unfortunately, a director’s commentary to confirm was not featured on the DVD, while the Blu-Ray’s “Animator’s Corner” was mostly technical, so maybe I’m just being hopeful. The favorite of a lot of people who commented on previous columns, apparently, and if the nomination of Flayrah for Best Magazine is any indication, that may mean something. It has also won a lot of other awards. I have no idea if winning Best Animated Feature at the Oscars really affects how furries will vote (and am absolutely sure that winning the winning the Boston Society of Film Critics’ animated award won’t). But it might. 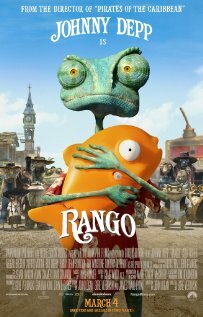 Rango seems more like a passion vote than a consensus favorite. It has a lot of passionate fans. However, I still doubt if that translates to the voters as a group. I’m tempted to write Rio off as the Ursa Major’s answer to Midnight in Paris in the Oscar Best Picture race. In other words, all the pundits agreed it would be a nominee, but no one actually thought it would win the race. My main problem is that the “man on the street” is fond of this movie. 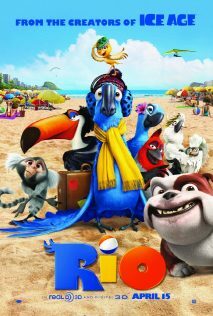 A lot of non-furries really seem to like this movie, and liked to tell me they liked this movie. In theory, this means furries should like it even more. That being said, I still think it has the least chance of winning. It was an honor to be nominated. I can also pretty much confirm this is the first time anyone has compared Rio to Midnight in Paris in any way. My review: I didn’t review this movie, but here is Crafty Andy of Furry News Network’s video review. I enjoyed Rango, but it's definitely not the sort of movie you'd plonk the kids in front of. The posters are interesting in that the stronger movies primarily depict a key protagonist. Rio and Bitter Lake seem unwilling to bet it all on one character (the latter has half of the poster taken up by the lake, which I hardly recall being at all). It took me a while to figure out that Priscilla was a girl - I missed the name and pigtails, and, well, cactus mouse. My mother's a third grade teacher; I asked her if she thought it was appropriate for that class, and she said she wouldn't show it to her class because they wouldn't get it. She didn't have much problem with the content, however.